A wide ranging international study that genetically analysed the DNA of a series of famous and controversial ancient remains across North and South America has discovered that the Spirit Cave remains -- the world's oldest natural mummy - was a Native American. They were also able to dismiss a longstanding theory that a group called Paleoamericans existed in North America before Native Americans. 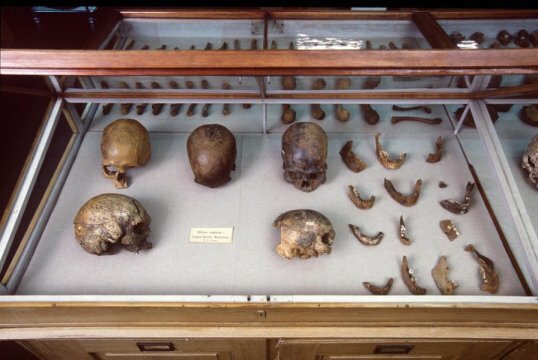 These are skulls and other human remains from P.W. Lund's Collection from Lagoa Santa, Brazil kept in the Natural History Museum of Denmark. A legal battle over a 10,600 year old ancient skeleton -- called the 'Spirit Cave Mummy' -- has ended after advanced DNA sequencing found it was related to a Native American tribe. The revelation has been published in Science today (Thursday, November 8 at 14:00 US Eastern Time) as part of a wide ranging international study that genetically analysed the DNA of a series of famous and controversial ancient remains across North and South America including Spirit Cave, the Lovelock skeletons, the Lagoa Santa remains, an Inca mummy, and the oldest remains in Chilean Patagonia. The study also looked at the second oldest human remains from Trail Creek Cave in Alaska -- a 9,000 year old milk tooth from a young girl. Scientists sequenced 15 ancient genomes spanning from Alaska to Patagonia and were able to track the movements of the first humans as they spread across the Americas at "astonishing" speed during the Ice Age, and also how they interacted with each other in the following millennia. The team of academics not only discovered that the Spirit Cave remains -- the world's oldest natural mummy -- was a Native American but they were able to dismiss a longstanding theory that a group called Paleoamericans existed in North America before Native Americans. The ground-breaking research also discovered clues of a puzzling Australasian genetic signal in the 10,400 year old Lagoa Santa remains from Brazil revealing a previously unknown group of early South Americans -- but the Australasian link left no genetic trace in North America. It was described by one of the scientists as 'extraordinary evidence of an extraordinary chapter in human history'. Professor Eske Willeslev, who holds positions both at St John's College, University of Cambridge, and the University of Copenhagen, and led the study, said: "Spirit Cave and Lagoa Santa were very controversial because they were identified as so-called 'Paleoamericans' based on craniometry -- it was determined that the shape of their skulls was different to current day Native Americans. Our study proves that Spirit Cave and Lagoa Santa were actually genetically closer to contemporary Native Americans than to any other ancient or contemporary group sequenced to date." The Lagoa Santa remains were retrieved by Danish explorer Peter W. Lund in the 19th century and his work led to this 'Paleoamerican hypothesis' based on cranial morphology that theorised the famous group of skeletons could not be Native Americans. But this new study disproves that theory and the findings were published by Professor Willeslev with representatives from the Brazilian National Museum in Rio on Tuesday, November 6 2018. He added: "Looking at the bumps and shapes of a head does not help you understand the true genetic ancestry of a population -- we have proved that you can have people who look very different but are closely related." The scientific and cultural significance of the Spirit Cave remains, which were found in 1940 in a small rocky alcove in the Great Basin Desert, was not properly understood for 50 years. The preserved remains of the man in his forties were initially believed to be between 1,500 and 2000 years old, but during the 1990s new textile and hair testing dated the skeleton at 10,600 years old. The Fallon Paiute-Shoshone Tribe, a group of Native Americans based in Nevada near Spirit Cave, claimed cultural affiliation with the skeleton and requested immediate repatriation of the remains under the Native American Graves Protection and Repatriation Act. The request was refused because the ancestry was disputed, the tribe sued the federal government and the lawsuit pitted tribal leaders against anthropologists, who argued the remains provided invaluable insights into North America's earliest inhabitants and should continue to be displayed in a museum. The deadlock continued for 20 years until the tribe agreed that Professor Willeslev could carry out genome sequencing on DNA extracted from the Spirit Cave for the first time. Professor Willeslev said: "I assured the tribe that my group would not do the DNA testing unless they gave permission and it was agreed that if Spirit Cave was genetically a Native American the mummy would be repatriated to the tribe." The team painstakingly extracted DNA from the petrus bone from the inside of the skull proving that the skeleton was an ancestor of present day Native Americans. Spirit Cave was returned to the tribe in 2016 and there was a private reburial ceremony earlier this year that Professor Willeslev attended and details have just been released. The geneticist explained: "What became very clear to me was that this was a deeply emotional and deeply cultural event. The tribe have real feelings for Spirit Cave, which as a European it can be hard to understand but for us it would very much be like burying our mother, father, sister or brother. "We can all imagine what it would be like if our father or mother was put in an exhibition and they had that same feeling for Spirit Cave. It has been a privilege to work with them." The tribe were kept informed throughout the two year project and two members visited the lab in Copenhagen to meet the scientists and they were present when all of the DNA sampling was taken. A statement from the Fallon Paiute-Shoshone Tribe, said: "The Tribe has had a lot of experience with members of the scientific community, mostly negative. However, there are a handful of scientists that seemed to understand the Tribe's perspective and Eske Willerslev was one of them.